Anti-corruption activists try to make those in power answerable to people. We call this accountability. NGOs try to make “accountability” happen by training citizens to audit local government or monitor elections, often using social media to report and collaborate. But when the initial enthusiasm for what are often called social accountability instruments fails or issues become too complex or time-consuming for the average citizen, how will we ensure that we achieve our goals: giving people a voice to combat social injustice and corruption in their daily life? One of our most simple ways of doing this is to make them more aware of their rights: in the very place where those rights are most likely to be abused. 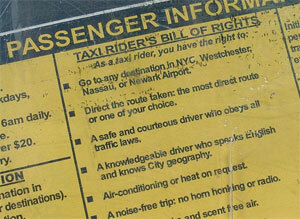 Take for inspiration this passenger bill of rights, displayed literally right in your face at the backrest of the driver’s seat in New York taxis. Imagine how much more effectively you can claim your rights and how much more hesitant a corrupt driver will be to try to take advantage of you, even if you are not from New York and have no idea how this place works. Or think about how much easier it is for you to report unsanitary conditions in this public toilet at Seoul airport when you are presented with a sign like the below. It gives you detailed information about the person in charge and a number to call, both in Korean and English. The classic example may be familiar to many: How is my driving stickers on the back of trucks or other vehicles. You might not have consciously noticed them, but you sure will if unsafe driving by this vehicle puts you at risk. And very interestingly this is one of the very few applications, whose impact has been thoroughly documented: a reduction of accidents rates by 20 to 40% not even because many people call and complain, but simply through the disciplining effect on the driver. All of these approaches involve using the physical environment in the actual place where corruption occurs to help people understand their rights, who is in charge and what they can do if something is going wrong. We could call this ‘ambient accountability’ a big word, but a simple concept. If activists can master the use of physical environments to help citizens, we would have a powerful weapon against corruption. A very simple approach to ambient accountability? Anti-corruption messages in Mauritania and Namibia exhorting people not to take bribes or report corruption. Yet, this is only beginning and we could think about much more specific and targeted measures that give people detailed information right when and where they need it when dealing with potentially corrupt officials – along the lines of the passenger bill of rights presented above. Lifting the veil of anonymity is an essential first step to ensure that someone can be held responsible and identification tags clearly visible when dealing with an official are essential for this. Transparency International Russia, for example, has promoted and organised citizen checks on police personnel to verify that they wear proper identification tags as required by law. But here is a challenge: The solutions I have mentioned so far are all low-tech. What happens when you involve social media? An explosion of powerful applications that can help hold government and business to account for their performance right where they are. 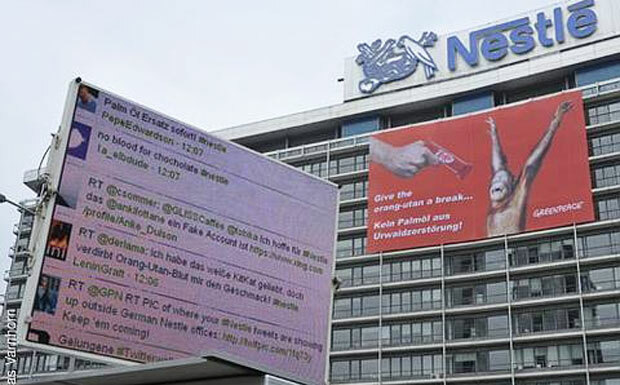 Greenpeace twitter wall outside corporate headquarter to confront executives with real-time public outrage about allegedly unsustainable palm oil use. Many forms of ambient accountability are already being practiced in unexpected places and settings, but without a real focus on corruption issues and with very limited understanding of what works best when. There is much to learn, much to adapt to the corruption field and much, much more new stuff that can be tried out. And most importantly thinking about ways to use physical space for more accountability brings a host of new ideas and allies into the debate: from architects and designers, to urban planners and artists. So let’s get physical! For much more on this idea, lots of examples and many promising ways to take this forward, please read on in this working paper. Comments, ideas, expressions of interest to collaborate most welcome.